Humanity in the world and in the meetings industry will be the central common theme to the key trends of 2018, predicts Imex, which takes place in Frankfurt from May 15 to 17 and in Las Vegas from October 16 to 18. After years when technology has been revolutionising the meetings industry and accelerating the rate of change in how we live and work, in 2018 there will be a return to a focus on people. That is not to say that new technology innovations will not continue to transform the world around us. Guest management might one day be fully automated, big data and processes will have everything communicating with everything, and new concepts such as Virtual Companions and A (Automated) – Commerce, the successor to e-commerce, will soon be with us. But at this time more people are asking questions, throughout this industry and in society, about whether people - and their lives, their feelings, their aspirations, their health and their minds – are being sufficiently prioritised as society copes with challenges and adapts to progress. Here are five trends, each with people at the heart of the issue, that Imex believes will be clearly evident and highly influential in 2018. In 2016 in particular, security became one of the greatest challenges of our time. Subsequent events have brought the industry very much together, notably when united in support of #VegasStrong at Imex America 2017 and they have reinforced the need for vigilance, resilience, unity and globally recognised and agreed standards. Attendees and staff at meetings and events of all types need all the confidence and reassurance that organisers and venues can give them that everything possible has been done to keep them safe. It is a topic that must remain top of mind and top of the agenda in 2018. In recent months, ‘anti-tourism’ and ‘over-tourism’ movements have come to the fore in many cities. There has been an outcry from people who feel that too much tourism is damaging their communities and their lives. Rumblings of discontent have been exacerbated in many areas by the explosion in the use of services such as Airbnb and Uber. There is now a ‘kickback’ with resistance leading to a slowing down in the growth of these businesses. All these issues will continue through 2018; however, this presents a unique opportunity for the business events industry to define itself as distinct from leisure tourism. The industry must continue to strongly communicate the short and long-term benefits that meetings, events and incentive travel bring to a destination – both in terms of the high impact direct benefits, as well as longer term indirect benefits associated with the development of knowledge and innovation economies. The rising importance of diversity, particularly around women in the workplace and career advancement, is important across all sectors, and the meetings and events industry is no exception. After an overwhelming response to our joint research project with tw tagungswirtschaft magazine, there were enormously positive reactions to the Women in Leadership receptions that took place at our shows in 2017. 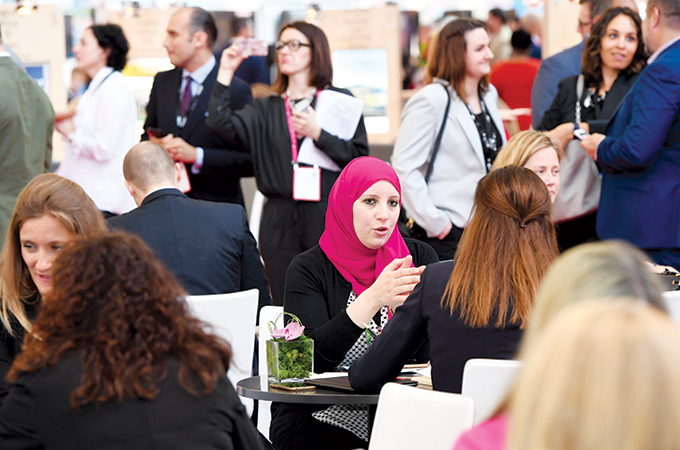 As a consequence, Imex has now launched, with tw, the first ‘She Means Business’ conference taking place on EduMonday (the day prior to Imex in Frankfurt 2018), giving women – and men – from across the world the space to explore the issues that matter. She Means Business has a series of inspiring speakers, all women who are trailblazers in their field, and is set to celebrate the role of women in the industry, as well as providing conversation, collaboration and learning. A survey carried out by MPI for Imex revealed that only 5 per cent of the meetings professionals surveyed felt no stress at work. Skift dedicated its recent annual big topic special edition to ‘Travel in the age of Permanxiety.’ It described this as ‘a near-constant state of anxiety exacerbated by hyper-connected citizens using social platforms to create a state of permanent frenzy about a lengthy list of issues from terrorism and Trumpism to technology and economic gaps’. Most employers and event organisers are aware of this as a growing concern and are starting to put processes and facilities in place to help alleviate it. At Imex exhibitions the Be Well Lounge, runs yoga and meditation sessions, as well as new white space areas, which act as a place to unwind. 5. Life 3.0 – when robots are replacing humans at work, what will humans do all day? Economist Todd Buchholz, in his keynote at Imex America 2017, cited worries about the effect of AI and robots on job security as one of the main causes of the ‘age of anxiety’. Louise Brownhill, chief learning officer at PwC, recently quantified the potential impact saying that "In five years, a third of human jobs in professional services firms will be replaced by AI." This issue is becoming monumental, described by some as the ‘Fourth Industrial Revolution’ and by Professor Max Tegmark of Massachusetts Institute of Technology as the start of ‘Life 3.0.’ – "how can we grow our prosperity through automation without leaving people lacking income and purpose?" Robots will force us to be creative, says Sir Nicholas Serota, head of Arts Council England, highlighting the need to skill people to work in an adaptable way to changing environments. Toby Walsh, Professor of Artificial Intelligence at the University of New South Wales, suggests that "we might just work a shorter week. That was the case in the Industrial Revolution. Before the Industrial Revolution, many worked 60 hours per week. After the Industrial Revolution, work reduced to around 40 hours per week. The same could happen with the unfolding AI Revolution." The effect this will have on meetings and events is a topic of rising interest with Event MB, for example, exploring the Rise of Artificial Intelligence and How Artificial Intelligence is Changing Events in a number of recent content pieces. Although event technology is automating so many administrative tasks, the essence of this industry is that it is the creative human led approach that delivers results. At its heart this industry exists to bring people together face-to-face in effective ways to help them achieve business and transfer ideas, to learn from one another and to build relationships. While event professionals need to be ever sensitive to how AI and robots impact on the sectors that they work with and cannot be complacent, the interaction of people and being sensitive to their needs and how they express them is an irreplaceable factor that is central to arranging and running meetings and events. Summing up these trends, Carina Bauer, CEO of the Imex Group, says: "This is, as often said, ‘a people industry’ and while we promote and support technology, we must take note of these trends, and look after our people, their health, their safety, their sense of fulfilment and their futures."